The quickest way from point A to point B is a straight line — or, if you are a bus rider, a direct route. As part of an initiative to improve bus travel for riders in Philadelphia, the Southeastern Pennsylvania Transportation Authority (SEPTA) and the City’s Office of Transportation and Infrastructure have partnered on the Greater Philadelphia region’s first direct bus route, the “Boulevard Direct.” The service is an enhancement of SEPTA’s current Route 14, which carries more than 10,000 riders every weekday from the authority’s Frankford Transportation Center (FTC) in Northeast Philadelphia to the Neshaminy and Oxford Valley malls in nearby Bucks County, Pa., via the very busy Roosevelt Boulevard (U.S. Route 1). SEPTA’s regular Route 14 makes approximately 80 stops on the 10-mile run from FTC to Neshaminy Mall, carrying many workers to their jobs and shoppers to a variety of retail centers along the way. Boulevard Direct buses make only eight stops at key intersections in that same 10-mile stretch, reducing travel time from 47 minutes to approximately 30. “Route 1 is a high-volume travel corridor — and this service will save riders valuable time,” said SEPTA GM Jeffrey D. Knueppel. Not only is Route 1 a high travel thoroughfare, it has been labeled as one of the most dangerous roads in Pennsylvania. The City of Philadelphia is working to improve safety on Roosevelt Boulevard through initiatives like the Boulevard Direct service enhancement. There are 10 new stations within Philadelphia to accommodate riders traveling in both directions. 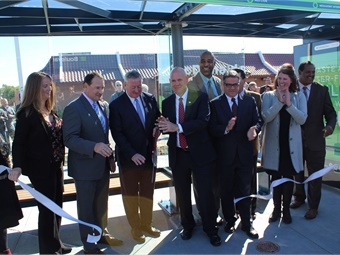 These new stations include new plazas and curbs, ADA ramps, bus shelters that serve both Route 14 and Boulevard Direct customers, free standing bench seating, pedestrian-scale lighting, landscaping, solar trash and recycling receptacles, and wayfinding signage. “The City’s recently released Three-Year Vision Zero Action Plan highlights the need for change on Roosevelt Boulevard,” said Mike DiBerardinis, managing director for the City of Philadelphia. "We are all encouraged to see change happening on the Boulevard, where transit riders waiting for the bus are more visible." Boulevard Direct stops were chosen as a result of SEPTA ridership analysis. 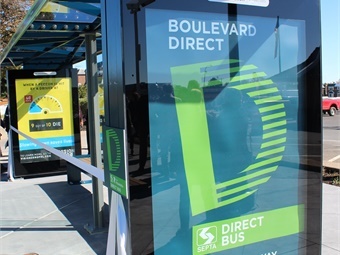 The stops account for half of all bus riders along Roosevelt Boulevard and intersect with existing bus connections for riders transferring to other routes. During the weekday morning and evening rush hours, buses run every 10 minutes; service during most other time periods is every 15 minutes. 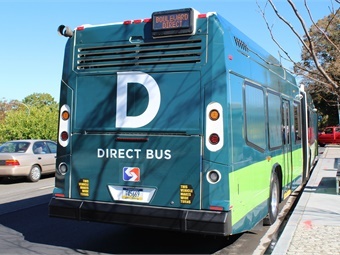 To ensure riders board the correct buses, SEPTA has outfitted the 60-foot articulated diesel-electric hybrid vehicles with wraps designed with the Boulevard Direct branding. The Boulevard Direct service launched on October 22. While complete ridership data is still being complied, one month in the enhanced service was attracting approximately 2,700 riders in each direction per day. SEPTA anticipates that number to continue to grow as early feedback from customers and operators to date has been positive from passengers and operators. 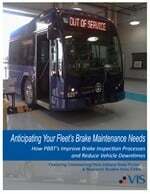 SEPTA Customer Service has received commendations from riders on the enhanced service.